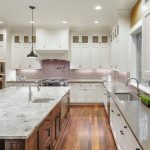 Granite countertops are a wonderful way to add style and character to your home.In the past, granite countertops were only used in high-end homes, so many people think they could never possibly afford to go with granite.This is not the case anymore. Granite is very cost-effective and budget-friendly. Granite is now the most popular and most common material used for countertops, so you can create a space that feels expensive and luxurious without breaking the bank. Granite countertops are made out of naturally occurring material. Granite is not engineered or manufactured. Because of this, granite countertops are very durable.Granite is chip-resistant, heat-resistant and scratch-resistant. You can be confident that your investment will last a very long time and keep on looking good. You won’t need to worry about your kids scratching your beautiful countertops or ruining them by not using a hot pad or trivet.Granite countertops are very kid-friendly while still looking top-notch. Installing granite countertops will add value and appeal to your home should you ever decide to sell. Everyone looks for homes with granite countertops when they are looking to buy. Granite is a huge selling point! Granite countertops are a wonderful way to upgrade your home. And since no two slabs of granite are exactly the same, you can avoid the cookie cutter look. You will have countertops that are different and unique. Granite can also be finished off in many ways. There are several choices you can choose from to finish the edges that also add your own individual flair.You can be confident that no one else will have the same countertops. At The Granite Guy, we can help you with all your countertop needs. We can help you pick the perfect granite countertops to upgrade your kitchen and make it beautiful again. Stop by our showroom today!